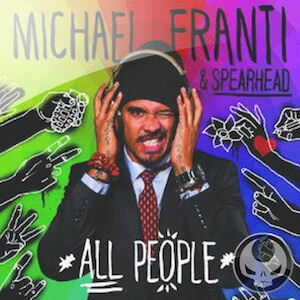 RapReviews.com Feature for July 30, 2013 - Michael Franti & Spearhead's "All People"
I always seem to say this when I review one of his albums, but it's been too long since we've spoken of Michael Franti. He's as much singer as rapper these days, but is honestly one of the few people other than Lauryn Hill who I believe is equally skilled at both - and enjoy either way. These days most audiences know him from his bubbly anthem to joy and relationships "Say Hey (I Love You)," but my first taste of him back in the early 1990's was as a protest rapper who was as much spoken word poet as emcee. He has grown in his sound since then - incorporating folk music, reggae, modern rock and even the punk aesthetic into his mix. One thing that hasn't changed is his ability to make protest music, such as tracks like "11:59:59." The live version is a little different from the album one, but this is a good taste. One tribe and all of us singing"
Don't wanna be no one night stand..."
I've actually seen some criticism of the this crossover hit as being "too bubblegum," which makes me wonder if those same people didn't like "Say Hey (I Love You)" too. To me proclaiming love is a protest in itself these days, when so much of the world has been divided by religious and racial prejudice and intolerance. Franti is unpretentious about his views and his attitude - he doesn't eschew wearing shoes to be cool or say "leather is murder" - he just does what feels right. And he's not anti-vice or straight edge - he talks about rolling joints and drinking beer on "Long Ride Home." I think the best word for Franti is "ebullient." He believes in feeling good, and sharing that good feeling. The 40 or so minutes of "All People" are what I imagine taking a shower in a waterfall on a hot summer day would be like - and if you're too far removed from nature to do that then it's like putting on your swim trunks and running around an open fire hydrant. You can't mean mug or ice grill to songs like "Life Is Better With You" and "Wherever You Are." In fact if you're in a long distance relationship, the later song would be a good song to play for your significant other the next time you two chat online or via FaceTime. Franti is spiritual, but in that pantheistic way that says "your God and my God are all the same," so you can never feel judged or left out listening to his music. If people think songs like "On and On" don't have enough of his protest vibes, I beg to differ. KRS-One may have once famously said that "if negativity comes with a 22, positivity comes with a 45" but Franti's music proves that love can be a weapon too.